The second installment in the series containing a collection of the most sought after and hard to find disco/boogie breaks, drum loops and sounds. This selection of ready-to-use samples from electrofunk and post-disco records offers a pack of in-demand kicks, snares, clapping sounds, horns, vocals, guitar riffs, percussion, drums, synthesizers and slap bass loops, digitally remastered for your beat making pleasure. The second volume contains under-discovered samples you will never find on any other break records and strictly focuses on vinyl that's hard to find at your local stores, flea markets or record shows. This comprehensive slice of 80s club joints is a celebration of evolution from disco and funk to hip-hop and modern deejay dance music. 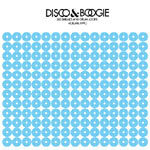 Disco & Boogie: 200 Breaks And Drum Loops is a must-have library for producers and a guide to vivid disco/boogie collectors.